Joseph Alois Schumpeter has long been recognised as one of the great economists of the 20th Century, and his truly revolutionary approach to economic development continues to gain appreciation. This is particularly due to the emphasis he places on innovation and creative destruction as drivers of economic development. Yet, aspects of his theory remain neglected and poorly understood, especially his treatment of prices and price dynamics. 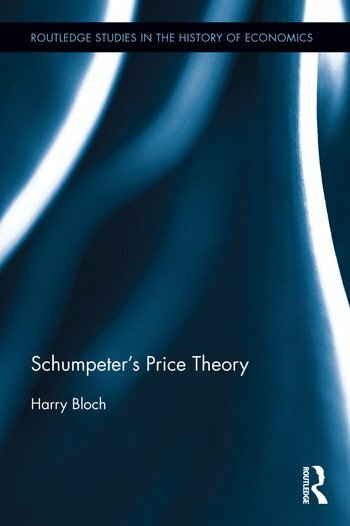 This book provides a comprehensive and critical examination of Schumpeter’s price theory as well as providing suggestions for the further development of the theory. While Schumpeter’s theories of economic development, entrepreneurship and the business cycle have received substantial attention in the literature, his price theory has been neglected. Yet, he proposes a price theory that is as radical as his treatment of other topics. The holistic nature of his theory also naturally means that a better understanding of his price theory will provide extra insight into other aspects of his theoretical framework. This volume is of great interest to those who study Schumpeter’s work, as well as those who have an interest in history of economic thought, economic theory and philosophy and political economy. Harry Bloch is currently John Curtin Distinguished Emeritus at Curtin University, Australia, having previously been Professor of Economics (1997 to 2012) and Dean for Research and Development (2012) in the Curtin Business School as well as founding director of the Centre for Research in Applied Economics (2006 to 2009). He is a Fellow of the Academy of the Social Sciences in Australia and an Honorary Fellow of the Economic Society of Australia.